Gluten-free gastronomes may or may not lament the loss of Tex-Mex cuisine staple: the flour tortilla. I’m partial to corn, myself, but there’s just something texturally exquisite about dipping a flour tortilla in queso or the sheer bendy-ness of flour tortillas. Lisa from Homesick Texan came over on this glorious Spring day to show me the ropes of tortilla-making. 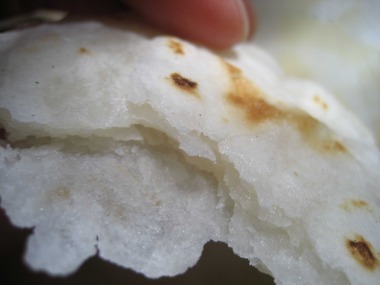 There are a ton of corn tortilla recipes out there, and we followed what seems to be the standard: masa harina, water, pinch of baking soda and salt. 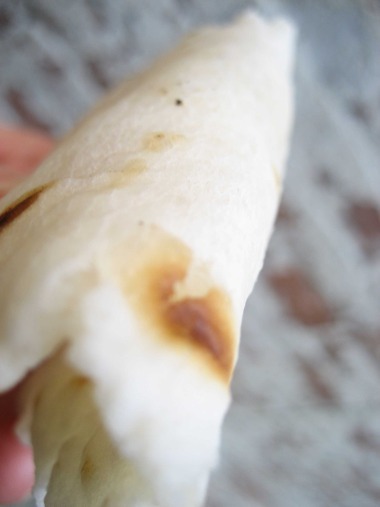 In this post, I’ll focus on the not-so-available gluten-free flour tortilla recipe! Los dos presses. I borrowed a press from a friend, and Lisa brought one, too. We started by making our flour tortilla dough. Though, by making them gluten free, it probably wasn’t necessary to let the dough rest (as you would for the gluten-ful ones.) We modified her regular gluten flour tortilla recipe by using the following gluten-free flour mix in place of all-purpose flour, and for these we used leaf lard (my new favourite GF baking substance) instead of oil and milk. Note: We made a batch with tapioca starch in place of the arrowroot and the results were gummy and too bitter, which is my typical tapioca starch experience as of late. So in this case I wouldn’t recommend subbing anything besides maybe cornstarch (but haven’t tried it!) for the arrowroot. After a few minutes the lard will melt down and incorporate into the water. Keep stirring the wet mix (to keep it well-incorporated) as you pour it into a large mixing bowl containing 2 cups gluten-free flour mix (recipe above). I ditched my spoon and mixed with my hands. Unlike many GF baking endeavors, this dough won’t require you to grease your hands first (because of the leaf lard!) Incorporate all dry flour into the lard/water mix by smashing it together and balling it up with your hands, only add a tad more water if the dough won’t ball and stick together (still too crumbly.) Tear off a little crumb from your dough ball and taste it (yes, it’s okay to do this.) Does it need salt? Add another pinch if it’s bland. 2. Place a cast-iron skillet or flat griddle on a med-low burner and let it heat up. You don’t need any butter or oil, although, the better seasoned your skillet the better. We added just enough olive oil to dampen the skillet when it dried out and started smoking from the heat. 3. 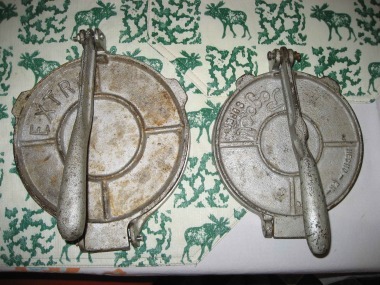 Now, get out your tortilla press! Tear off two small sheets of parchment paper (big enough to cover the diameter of the press); smooth and drop a ball about the size of a heaping Tablespoon onto the parchment covered press, place top parchment sheet over it and press. 4. Peel back the top piece of parchment paper carefully. Then peel off the other piece of paper, dropping the flat, uncooked tortilla in your hand, and return the paper to the press for re-use. 5. Drop flat tortilla dough on hot skillet and cook it for about 45 seconds to 1 min. Look for little bubbles pushing the dough up (they won’t pop through the dough like a pancake.) Flip with a spatula and notice little browning spots where your bubbles were. Cook for another 45 sec to 1 min on this side. 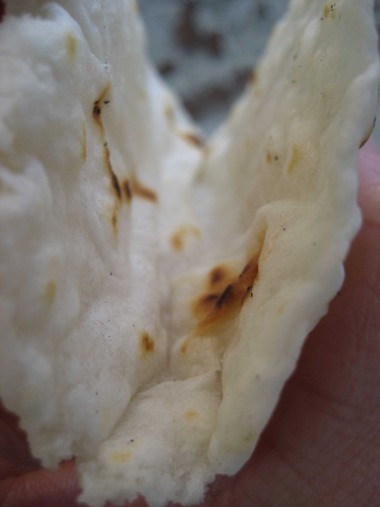 The tortilla will start to puff up forming a little convex, at which point flip again. Cook for about 30 seconds more, or until this side, which is sorta concave, puffs out equally. Puffs on both sides! This is pure air and flake! Real-deal flake-age, the signature feature of a gluten flour tortilla!And, for the REAL test: Homesick Texan’s taste buds. Verdict: She likes it! Looks, tastes and mostly feels like a regular gluten flour tortilla. It bends without breaking!!! (And, yes, photographing my tortilla’s crease feels slightly obscene) On the flip side. This taco’s not letting any savory bits looseQuestion for any experienced gluten-free bakers who use leaf lard regularly: would you let the dough ‘rest’ overnight in the fridge in plastic wrap for any reason?